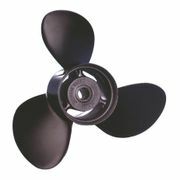 Michigan Wheel props are designed for trouble-free service and easy repairability. By using only the finest grade alloys, Michigan Wheel aluminum props are stronger than most original equipment props. The rubber hub bonded inside every Michigan Wheel prop helps protect expensive shafts, motors, and gear boxes from damage caused by the prop's impact with an object. Backed by a Limited Lifetime Manufacturer's Warranty. 10-3/8 dia x 13 pitch. Michigan part number: 031017. Applications: Mercury/Mariner 402-500-700 Series ('77-'84), 25 HP Bigfoot 4 Stroke ('99-'05), 30 HP 2&4 Stroke ('94-'05) 30 HP 2 Cyl. ('94 thru), 35 HP 2 Cyl. ('84-'89), 40 HP 2 Cyl. ('77-'83), 40 HP 4 Cyl. ('90 thru), 45 HP 4 Cyl. ('86-'89), 48 HP Mariner (All Years), 50 HP 4 Cyl. ('77-'85), 50 HP 3 Cyl. ('86 thru), 55 HP Mercury/ Sea Pro/ Marathon ('95 thru), 60 HP 3 Cyl. ('84 thru), 70 HP 3 Cyl. (thru '83).